New American Library. 378 pages. $26.95 hardcover, $15.99 Trade Paper, $11.99 eBook, Audiobook - pricing specials. In October 1969, William Albracht, the youngest Green Beret captain in Vietnam, took command of a remote hilltop outpost called Fire Base Kate, held by only 27 American soldiers and 150 Montagnard militiamen. He found their defenses woefully unprepared. At dawn the next morning, three North Vietnamese Army regiments—some 6,000 men—crossed the Cambodian border and attacked. Outnumbered three dozen to one, Albracht’s men held off repeated ground assaults by communist forces with fierce hand-to-hand fighting, air support and a dangerously close B-52 strike. For days, the NVA blanketed Kate in a rain of rockets, mortars, artillery, machineguns, and small arms, blocking efforts to resupply, reinforce, or evacuate the outpost. Albracht continually exposed himself to enemy fire to direct air strikes, to guide re-supply helicopters, to distribute ammunition and water to his men, to retrieve the dead and to rescue the wounded, often shielding men with his own body. Wounded by rocket shrapnel, he refused medical attention or evacuation. Exhausted from days without sleep, he continued to rally his men to beat off each new enemy attack. After five days, Kate’s defenders were out of ammo and water. Aerial resupply was suicidal, and reinforcements were denied by military commanders who had written off Kate. Albracht refused to surrender or die in place. Refusing to allow his men to surrender, Albracht led his troops, including many wounded, off the hill and on a daring night march through enemy lines. 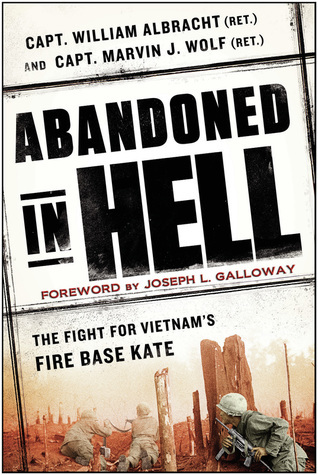 Abandoned in Hell is an astonishing memoir of leadership, sacrifice, and brutal violence, a riveting journey into Vietnam’s heart of darkness, and a compelling reminder of the transformational power of individual heroism. Not since Lone Survivor and We Were Soldiers Once, And Young has there been such a gripping and authentic account of battlefield courage. 'We Cheated Death.' Captain Bill 'Hawk' Albracht talks about his story as told in 'Abandoned in Hell' on TouchVision TV, 5 min. video.